Time to stay EASY fest.! Don't Miss it! 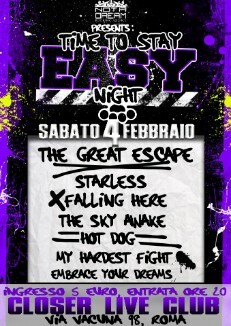 Don't miss "Time to Easy Night"! 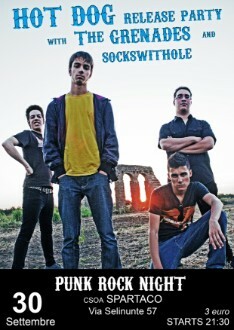 it's a pop-punk and Easy Core night, with the company of 7 bands from the Capital and not. 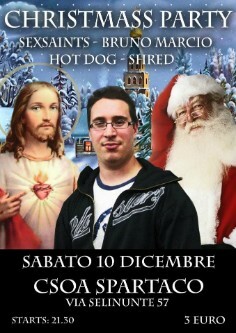 the concert will be locate in "Closer Live Club - Via Vacuna n.98 - Rome (IT)"
The concert will be locate in "Spazio Ebbro - Via Antonio Averulino Filarete n. 215 (Tor Pignattara) - Rome (IT)"
Christmass party with Hot Dog, Sexsaints, Shred and Succo Marcio; 4 energetic band from rome. 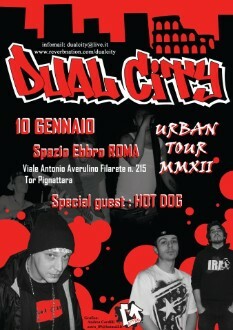 The concert will be locate in "CSOA Spartaco - Via Selinunte 57 - Rome (IT)"
Now you can also find us on "MONDO ALTERNATIVO"
Download FREE "Death & Glory" the first album by HOT DOG! 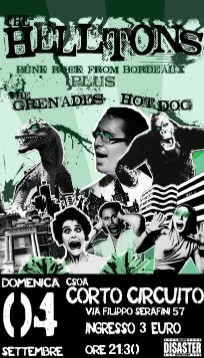 Finally the HOT DOG release party! 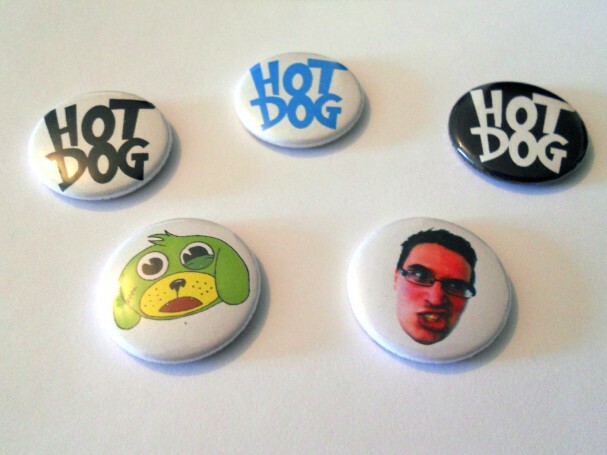 Hot Dog finally released their first album celebrating the event with a live. The concert will be locate in "CSOA Corto Circuito - Via Filippo Serafini 57 - Rome (IT)"
Our official videoclip "Personal Disaster" has reached 1000 views! Thanks to all!!! 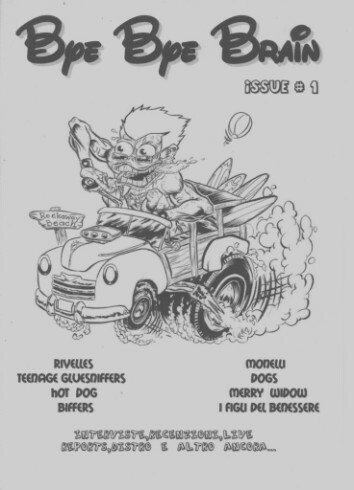 OUT NOW "BYE BYE BRAIN FANZINE #1"
HOT DOG and SNAPSHOT live in "Piazzale del Verano"
IFL CREW Records presents "San Lorenzo Estate - Live music city in Rome". Programme of the Punk Rock festival "IFL Crew Records"
The concert will be locate in "Piazzale del Verano - Rome (IT)" with FREE ENTRY! 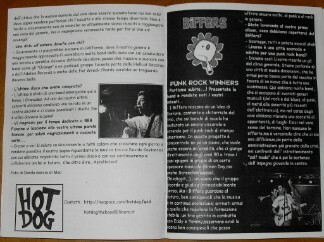 Soon will be available the # 1 of Bye Bye Brain fanzine with interviews to HOT DOG, BIFFERS, RIVELLES, MONELLI, DOGS, TEENAGE GLUESNIFFERS,MERRY WIDOW and I FIGLI DEL BENESSERE, reviews, live reports, contests and more...wait for us, we're almost there! 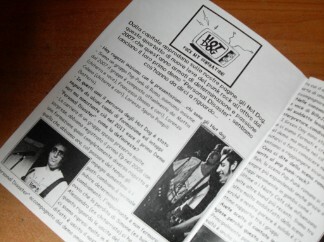 Double CD containing 38 tracks of both known and unknown people of the alternative scene! Here is the list of some bands which are present: Skelters, Good For One Day, Helia, Red Lights Flash, Bredford, Amnesia, One Eyed Jack, Faultless, Hot Dog, Maieutica, Shout Of Noise, Ironici Onirici, The Crazyzone, The Albions, Burning Like Torches, Fallsense, Waiting For X, Hot Drugs, White Night Dream, This Is A Standoff, If I Die Today, In Sane, Hopes Die Last, Duff, Mompestofaest, Biffers, Now Again, Only Dust, Run Away, Outcube, Lietafuria, New Disorder, My Hidden Phobia, Gain In Vain, Optional Moodm, Hangover, Watzlavich, Heroes Die Too. ‘Brain Stew’ Back to back Insomniac entries, Hot Dog in the mix now to cover another one of the top tier Green Day hits. It’s almost a garage rock version of the song, which I think fits this perfectly, I don’t think there’s a lot of Green Day songs that would match up with this style as well as this one.